This resort is a great choice for exploring the boutiques, antiques and restaurants of central Ubud, the scenic location between the Petanu River Valley and the cascading rice terraces offers sweeping verdant views throughout, as well as plentiful opportunities for rest and relaxation. 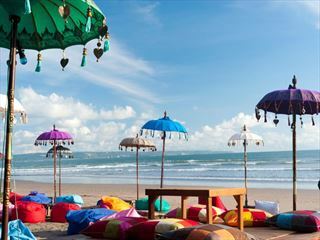 Start the day with a complimentary morning Yoga class, after breakfast join a walk through the rice paddies to see an unchanged way of life and meet local residents, or take a Balinese cooking class. After lunch relax by one of the two pools or visit the riverside spa where you can listen to the energising rushing water while you enjoy any one of the treatments from a full spa menu. Complimentary afternoon tea and a cocktail happy hour will keep you refreshed until dinner, where you have a choice of two wonderful restaurants at Maya Ubud. 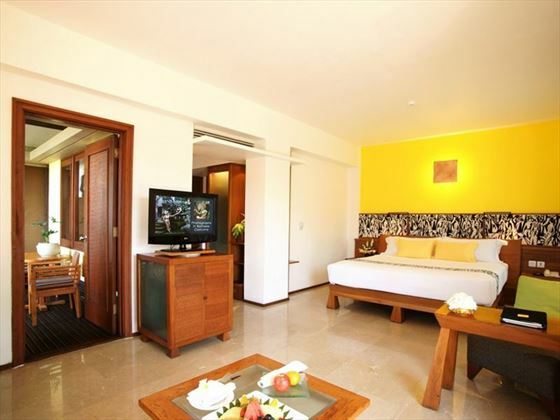 Situated a comfortable walking distance from Ubud center, within hectares of tropical gardens, the transfer time from the airport is around 1 hour by road. A complimentary shuttle bus will take you into central Ubud (9am - 5pm) or you can walk in around 25 minutes. The surrounding area gives you a great opportunity to explore the rice fields and natural wonders of the area. Defined by its stylish furnishings and refreshing colour palette, these 43sqm rooms are framed by several glass windows and doors, benefitting from natural light and beautiful views over the Petanu River Valley and Peliatan Rice Terraces. Accommodates up to two adults and one child. Fresh and inviting, these well-appointed rooms blend customised furnishings with uplifting burst of colour. 43 square metres of private living space ensures a comfortable and peaceful stay, along with a great selection of pampering amenities and beautiful views of the rice terraces or luscious valley. Accommodates up to two adults and one child. Spanning over 50 square metres of serene living space, these gorgeous villas are nestled into the lush tropical gardens. 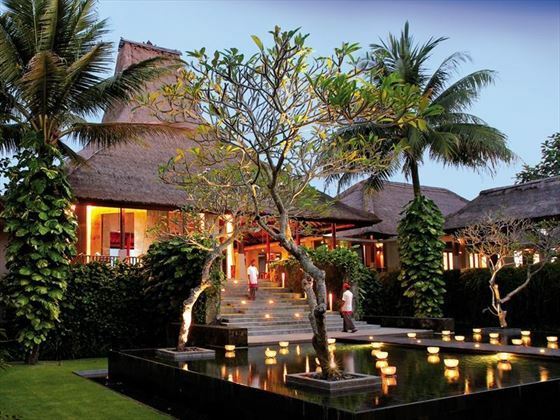 Appointed with classic Balinese design with elevated roofs and an elegant collection of locally-handcrafted furnishings. The luxurious en-suite bathroom, with a reclaimed timber valley, lends itself to spa-styled indulgence. Accommodates up to two adults and one child. 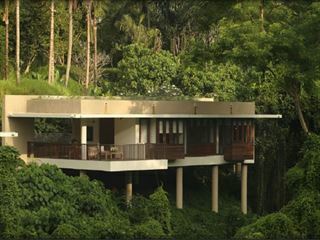 Boasting breath-taking surroundings of the river valley or tropical forest, these 50sqm hideaways put indulgence first. 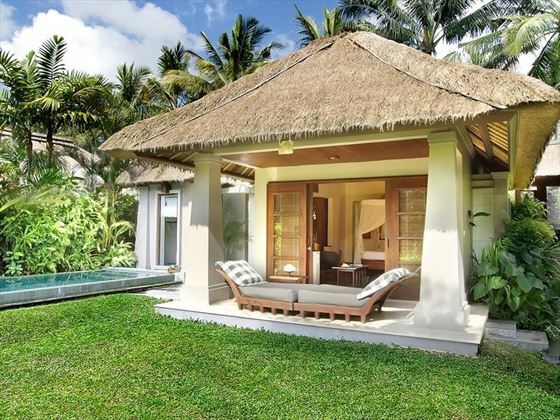 A traditionally thatched dwelling with an inviting and serene space, you’ll be promised utter privacy and luxury with tastefully-appointed furnishings and sumptuous amenities. Accommodates up to two adults and one child. Featuring a full glass frontage which overlooks a private pool, terrace and tropical forest, the Premier Pool Villa presents a refined balance between local Balinese inspiration and contemporary style, inviting the beauty of nature into your personal living space. Spanning over 50 square metres of complete privacy and serenity, these villas are appointed with handcrafted furnishings and classic works of art, alongside modern state-of-the-art amenities. Accommodates up to three adults, or two adults and one child. 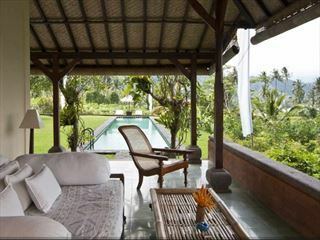 This spectacular villa offers an oversized terrace, ideal for relaxing by the plunge pool, with mesmerising views of the river valley whilst nestled in a private tropical Balinese garden. Overlooking the pool terrace and forest through a full glass frontage, these 50sqm hideaways are a celebration of Balinese style and contemporary refinements, with local works of art and repurposed timber furnishings. Accommodates up to three adults, or two adults and one child - an adjacent villa can connect via a private access to make a sizeable compound for families and friends. 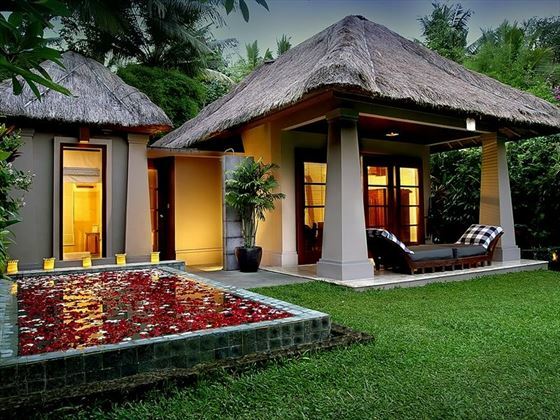 With ample, plush living space and a seamless connection with the outdoors, this 125 square metre villa is epitome of Balinese luxury. Separated over two floors, the use of natural stone, hardwoods and hand-crafted elements immerse the villa in the surrounding environment, whilst an infinity-edge swimming pool and open-air Jacuzzi highlight the essence of tropical living, with stunning views over Petanu river Valley. Accommodates up to two adults and two children. 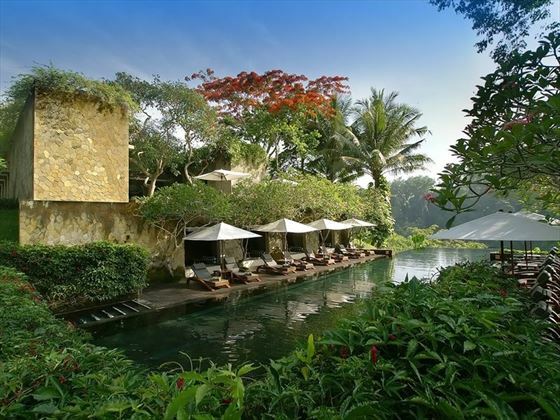 Incredibly expansive and luxurious, the resort’s presidential villa is enveloped by tropical splendour with views overlooking a swirling river winding in the valley below from two breath-taking levels. Offering 235 square metres of opulent living space, every single detail within this private sanctuary personifies the artistic hands of Balinese craftsmen, from high thatched ceilings and hand-crafted wooden furnishings to stainless steel vanity sinks and a sunken tub in the bathroom. Accommodates up to four adults, or two adults and two children. 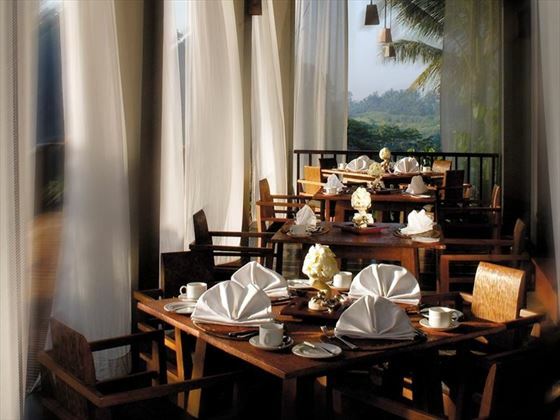 The resort’s main restaurant, Maya Sari is open all throughout the day for breakfast, lunch and dinner, offering magnificent views over the treetops from a serene setting high up in the resort. In the morning, enjoy an extensive breakfast buffet as the first rays of daylight shine through the trees, whilst lunch and dinner will be served a la carte, offering a delectable selection of local fare and international dishes paired with wines from around the world. 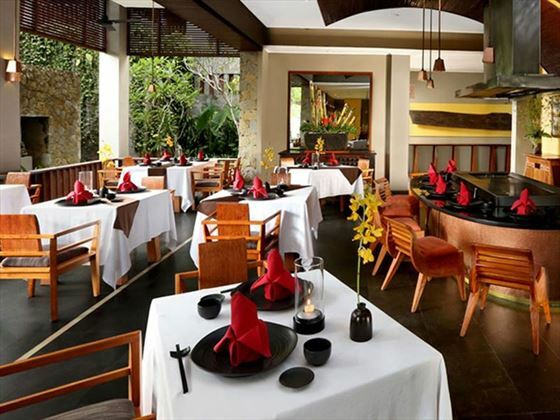 A charming eatery nestled within a canopy of vibrant blossoms and exotic flora, delight in specialty, regional Asian fare defined by rich layers of mouth-watering flavour; as you dine, the open-air views of the courtyard fountain and manicured gardens are simply wonderful. The restaurant also features an authentic teppanyaki counter indoors, where diners may enjoy a theatrical experience with your dish cooked to order. Inspired by organic and sustainably-sourced ingredients, the river café is focused on serving wholesome, healthy food with a stunning setting beside the tropical forest and picturesque river. A great choice for those with a specific dietary need, the menu offers a full selection of vegetarian, gluten-free, non-dairy and nourishing options. Located just off the lobby, this ambient bar is an elegant open-plan pavilion with wrap-around views of the resort edged by luscious valley scenery. Offering an inviting spot for intimate drinks or social gatherings with varied seating arrangements, the bar serves a full menu of beverages and snacks all throughout the day. A delightful complimentary afternoon tea is also available from 4pm to 5pm daily. For times when you’re in the mood for a little more privacy, you may enjoy a fantastic variety of cuisine in the comfort of your own room or villa with the convenience of 24-hour room service. The resort lends itself to the spirit of love with an incredibly romantic and serene setting; set beside colourful blossoms and the peaceful lake, you can wine and dine the evening away within a setting encompassed by glowing candles and fresh flowers, as the waiter tends to you as if you’re the only two people in the world. Celebrate a special occasion or just the simple fact that you’re together with an intimate candlelight dinner. Choose from an irresistible array of menus based on your personal culinary preferences, and delight in an unforgettable evening of incredible food and undeniable romance. 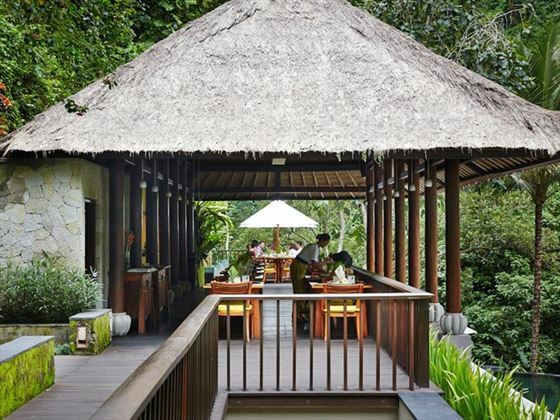 Join the expert Balinese Chefs as they share culinary secrets about the local specialities, followed by a tour of the Organic Spice and Herb Garden. You’ll then be taken to the village-style kitchen to learn how to prepare five popular dishes, before enjoying a relaxing lunch to sample your very own creations. You may also enjoy a visit to a traditional market at an additional price. There’s a choice of three exclusive picnic basket options available for you to share as you sit back and relax in a serene riverside pavilion, edged by breath-taking rainforest scenery. Orders for this experience must be placed one day in advance. Enjoy a relaxed outdoor dinner in the tranquil confines of your villa, surrounded by candles and the beauty of nature. Your very own chef will prepare your chosen menu of dishes for a full ‘grill to table’ dining experience. 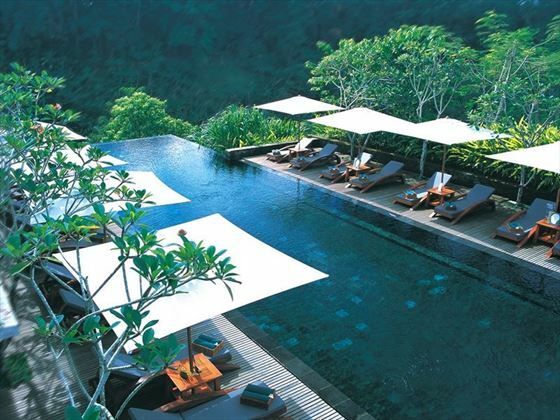 The main pool is a striking infinity pool with adjacent ids pool. There is another pool by the spa, which is an adult’s only area of the resort. The Spa has one of the most tranquil locations on property, in an adult’s only area besides the river, the perfect backdrop to a Balinese massage treatment. There is a fitness centre with a dedicated Yoga studio above with free daily morning yoga, a floodlit tennis court, mountain bikes can be hired or you can take a short tour with the resort guide for an insider look at the surrounding area. Guests can also enjoy a relaxing bathing experience from the privacy of their rooms - select from the In-room bath menu & a personal assistant will set this up for you 15-minutes prior to your requested bath time. Romantic Candlelit dinners can be arranged as well as couples massages.